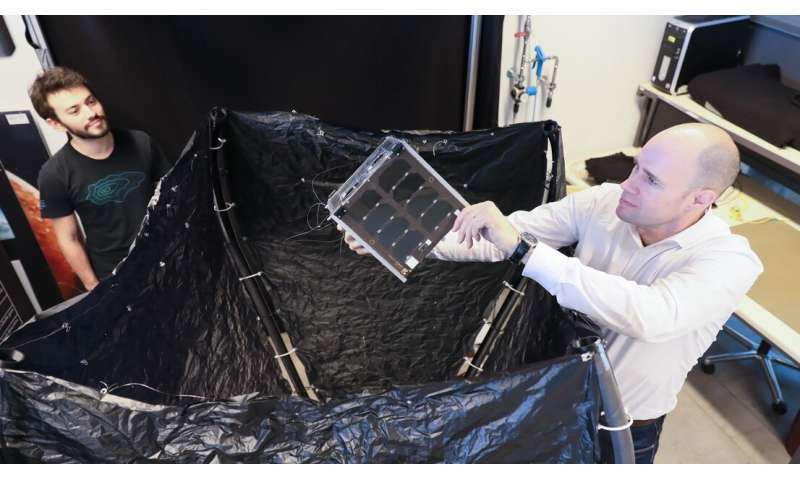 Since 2012, engineers at EPFL's Space Center have been hard at work on a new junk-clearing satellite to capture debris orbiting the earth. The team has now shifted up a gear, founding a company called ClearSpace to pick up where the CleanSpace One project leaves off. For the first test mission, penciled in for 2024, the company has set its sights on capturing and destroying SwissCube, a nanosatellite developed by students from EPFL and other Swiss universities and launched on 23 September 2009. Looking further ahead, the startup plans to develop a viable, cost-efficient system for cleaning up the estimated 3,000-or-so derelict satellites orbiting closest to earth. "We have no option but to clear space debris from Low Earth Orbit," says ClearSpace CEO Luc Piguet. "The viability of satellite technologies, which are an increasingly important part of our lives, is at stake." ClearSpace's satellite, similar in design to a drone, features a tapered net that shoots out, grabs a piece of debris and then retracts, trapping the junk in its clutches. The team's long-term plan is to launch a platform carrying multiple satellites. Ever since the world's first satellite was launched in 1957, space has become increasingly cluttered with junk of all shapes and sizes – from tiny nuts and paint chips to rocket stages and satellites the size of a bus. The problem is particularly acute in Low Earth Orbit, the area between around 100 km (the edge of earth's atmosphere) and 2,000 km above the surface of the planet. Using radar technology, scientists have so far identified and tracked some 22,000 pieces of debris bigger than 10 cm. That figure does not include smaller items, amounting to around 900,000 pieces larger than 1 cm – and around a hundred million measuring more than 1 mm. All of that fast-moving debris, flying around the planet at some 8 km per second, poses an ever-growing threat to spacecraft and crew. Yet capturing space junk is harder than it looks. The whole process demands extreme precision, and it takes place at mind-boggling speeds. The first task – actually locating a piece of debris – is challenging enough. Take SwissCube, for instance. Scientists currently know where it is to within 5 km or so, but pinpointing its exact location requires ultra-precision detection and identification systems involving lasers. The next stage of the process – the rendezvous – is just as problematic. The satellite needs to get close enough to capture the debris without touching it, because that could cause it to quickly fly off course and out of reach. The final step is to trap the junk firmly in the net before dragging it down through earth's atmosphere, where it will burn up. The engineers have to make sure their calculations and predictions are spot on before launching the satellite. Because once it has been released, they have no way to adjust its flight path or make repairs. ClearSpace recently signed a collaboration agreement with EPFL, focusing largely on the question of technology transfer. The startup has also secured funding from the European Space Agency (ESA) and local authorities, and it is in talks with a number of key industry partners. The company is expected to expand quickly in the coming year, yet it is already making its mark. For one, it is the only small business – alongside some industry heavyweights – to get through the first round of an ESA tender to deorbit one of the agency's derelict satellites.